The longbow has the same length as the shooter. The bow is one of rigid and flexible yew (or elm, maple..). There can be support provided for an arrow, or the shaft can rest on the holding hand. The bow will last longer if you use oil or grease to rub him frequently, and always relaxes after use. For the bowstrings we use hemp, tendons or intestines. To keep them supple they are greased regularly. The ends and the middle, where the notch of the arrow comes, can be reinforced by additional wraps. So you can also mark a notch point. Standardize also your own posture and position. Keeps e.g. also your hand with strained tendon always at the same spot on your ear. A deviation of 1 mm is remotely soon enlarged to 1m deviation! By arrow rest (on the grip) and keep point (on the string) each arrow is getting the same position. This promotes accurate shooting. For arrow shafts is usually used ash. The center of gravity must be within 7 to 10% before the center of the arrow. Thin arrows go further but are more fragile. For making arrows, see: spear. Up to a distance of about 100 m, it is possible for skilled archers to shoot pure. Self bow, longbow: right middle and right limbs. Reflex arc: intermediate and / or limbs bent away from the archer. Deflex arc: intermediate and / or limbs bent to the string or archer. Duoflex arc: combination of reflex and deflex bow. In india was also shot with ball and bow. In the middle of the string is then, like a catapult, a leather patch for the ball. When releasing the projectile, the arch is turned with a quick flick of the wrist sideways so that the bow (or your hand) is not affected. Was also used: an arrow stuck to the string, with a tube instead of a point. It can, like hail, contain multiple stones or bullets like shotgun slung. The arrow is fixed to the end of a rope and is swung as a sling, and released in the direction of the target. It is still used in the national Chinese marital arts (Wushu). 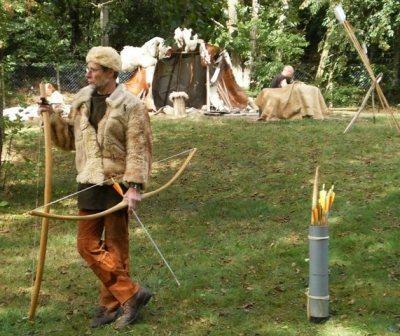 In Zonhoven (be) is each (two) year in September a European championship Prehistory, where participants have to take goals in a hunting course in nature with a homemade bow and arrow and spear (and thrower). Also making fire is part of their arts. You may also notice that specialization makes the master. The best material experts are not necessarily the most useful weapon makers. And also the best shooters don’t have to be the best hunters. It’s a good thing we have gravity. Or else when birds died they’d just stay right up there.